Just checking to see if anyone is planning on attending. I may, depending on the weather. Lets have some team flying. I'll be there, unless conditions are really bad. Is it too late to hop on a plane to SoCal? Air of Arctic origin swirls into Chicago Monday night and Tuesday, and the resultant temperature crash sends the city's readings from the lower 30s today to near zero, at least in the suburbs, 24 to 36 hours later. Strong winds and light snow, too, will accompany the temperature dive. Snow flurries and periods of somewhat more sustained light snow are likely to linger through Tuesday, but this is only a nuisance snow event. Two-day accumulations of less than two inches are indicated. Of greater significance: 20-30 m.p.h. northwest winds and subzero wind-chill temperatures on Tuesday. Um...I'll have to think about this. I don't mind 10-15 mph winds in this weather, but this may be too much. It's my last day of "freedom" before starting work, so maybe I'll still make the drive...it's not that far for me. Ugh...what to do...? Last edited by Jeff on Mon, Dec 31 2007, 10:45 AM, edited 1 time in total. Well, I almost didn't go...but I'm glad I did. Isaac and I braved the elements. 15 degrees, with winds at 12-15, gusting to 25. Wind chill somewhere in the -15 range. Still, while flying, I didn't feel all that cold. Winding the lines, however, that's another story. Weather held the crowd down, but there were some people there. We were flying to the music out in front of the store. Saw Cathy and Paul from the Fire near the end of the day. It was good to get out and fly. 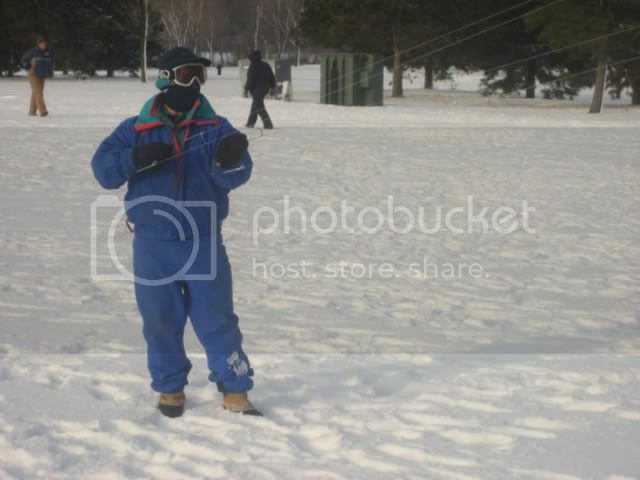 Had to wear full ski gear to keep out the cold. I thought my thumbs were going to break off while winding up my lines. I certainly look like a fool. Not so cool. WOW... My admiration for you...it takes brave people and real love for kite flying to do that. Here in California today, we had a bit of breeze and everyone started wearing jackets. 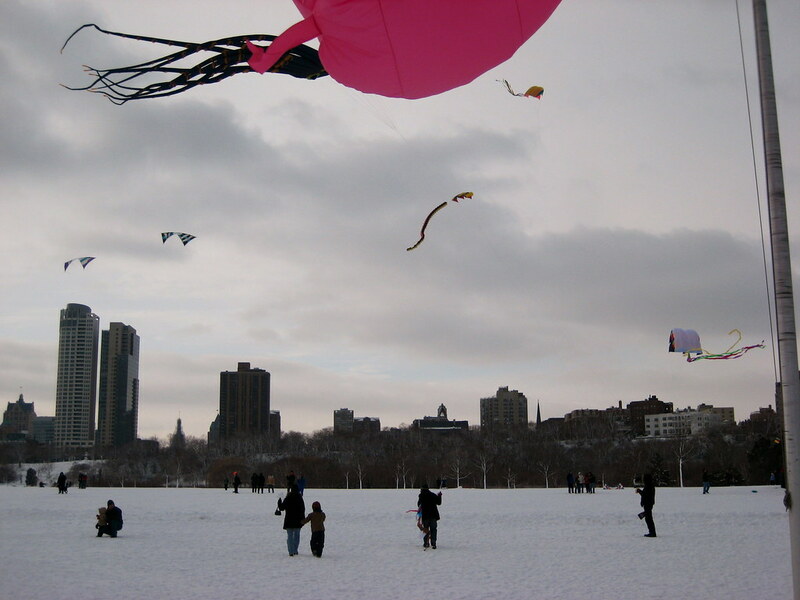 I trully admire you, and believe it or not, it is a beatiful scenery where you are at, something that some of us only dream of...been there in a white blanket of snow, and flying kites. Awesome. "Cool Fool Festival" (January 1st)...I'll be there (actually here) for the festivities. 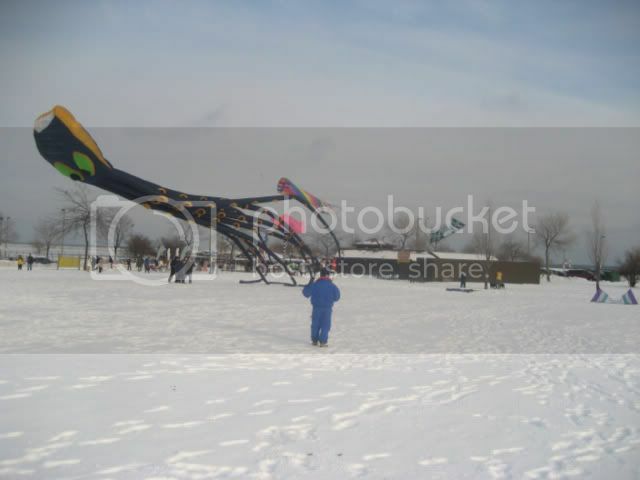 Let's hope the weather is a little more kite-worthy than last year! I nearly frozen my gazangles off! Hope to learn a few "controls" from you IKE veterans as I'm planning on going to Huntington in February and could use some (alot) of tips so I might join the Mega-Fly! A dream of mine! But, If not prepared by then I'll happily watch with glee! PS I already HATE WINTER! First of all Welcome Aboard Jynx. Yes Cool Fools is a nice way to fly in the new year. I had not made it out last year but had a year or two before that. Had a great time. You should look up Team Trejo, for he lives out your way. Also watch the forum for club flys that may be happening in the near future, you dont have to wait till news years day to fly with us IKE folk. Looking forwards to flying with you out at Kite Party too. glad to see you here--welcome!